CHICAGO, IL (September 10, 2013). TV Producer, inspirational speaker and founder of The Adelante Movement, Nely Galan, (The View, Celebrity Apprentice with Donald Trump, creator of The Swan), is bringing The Adelante Movement: Tour to Chicago, Illinois. Chicago was chosen after Windy-City Latinas spoke up and requested their city to be the next stop of Adelante, which is free of charge and features Sandra Cisneros, Chicago native, world-renowned author and MacArthur Fellow, and Nell Merlino, Founder and President of Count Me In for Women’s Economic Independence as well as other big surprise guests. Presented by Coca-Cola, Adelante Chicago’s day-long program includes inspirational speakers, business workshops, networking sessions, information about job opportunities at Coca-Cola, personal and professional development tips as well as financial and business advice to help Chicago Latinas create economic prosperity for their families. Adelante Chicago takes place Saturday, October 12, 9 am to 5 pm at The Museum of Broadcast Communications, 360 N. State Street, Chicago, IL 60654. The event is free but seating is limited. Register today at: theadelantemovement.com. Nely Galán, founder of the Adelante Movement, is a first generation Cuban immigrant and self-made media mogul, who recently co-hosted ABC’s “The View.” Nely is the first Latina president of a U.S. TV network (Telemundo) and creator of the hit FOX reality series “The Swan.” Nely was featured in HBO’s “The Latino List: Volume Two” and was also named one of People En Español’s 25 Most Powerful Women. She is an Emmy Award-winning producer of over 600 episodes of television in Spanish and English and the first Latina to appear on “Celebrity Apprentice with Donald Trump.” Currently Nely is executive producer and creator of “Celebrity Swan,” a new edition of her hit reality series, “The Swan,” which saw more than 10 million viewers and was sold around the world. 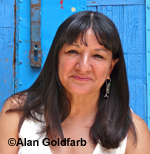 Sandra Cisneros is a Chicago native and a MacArthur fellow whose books have been translated into over 20 languages worldwide. Sandra’s latest book “Have You Seen Marie?” is an illustrated fable for adults, with art by Ester Hernández, published by Knopf . She is an internationally acclaimed author, educator, poet and Latina advocate. Her critically acclaimed novel “The House on Mango Street” has sold over two million copies and she has been the recipient of numerous awards, including the Lannan Literary Award and the American Book Award, and of fellowships from the National Endowment for the Arts and the MacArthur Foundation. She is also writing several projects, including a book of essays as autobiography, a collection of short stories, a book about writing and a new book of poems, among others. Sandra is the author of “Caramelo,” a collection of short stories “Woman Hollering Creek,” a book of poetry “Loose Woman,” and a children's book “Hairs/Pelitos.” She lives in San Antonio, Texas. Nell Merlino is Founder and President of Count Me In For Women's Economic Independence, the leading national not-for-profit provider of resources for women to grown their micro businesses into million dollar enterprises. Nell inspires entrepreneurs to think bigger and grow dramatically. She is a leading advocate and expert on women’s business leadership and empowerment who regularly appears on national TV. She is the creative force behind Take Our Daughters To Work Day, which moved millions of Americans to participate in a day giving young girls the opportunity to dream bigger about their future. Nell is the author of "Stepping Out of Line: Lessons for Women Who Want It Their Way...In Life, In Love, and At Work" from Broadway Books, which is available on Amazon.com. The Adelante Movement is a grassroots movement that aims to unite and empower Latinas economically through a digital platform and a national tour of live forums featuring powerful and accomplished female role models that inspire other women to reach for more. The Adelante Movement connects Latinas and their families to jobs, start-up funding, franchise and entrepreneurial opportunities, and mentorship—with the goal of creating a private sector solution to bringing economic stability to Latino families via moms, many of the heads of households and are the emerging economic market in the country. The idea is to create a private-public partnership that empowers this elite group of Latina leaders and members of The Adelante Movement, to create economic opportunities and prosperity in their communities. Watch and be inspired.